Zambians pride themselves on their reputation as a peaceful nation, and a peaceful people. It’s a well-deserved reputation. In decades of independence – as almost all their neighbours struggled through civil war and chronic instability – Zambia remained an island of calm; a beacon of relatively good democratic governance on a continent that’s not exactly known for it. That doesn’t mean that anyone should take Zambia’s stability for granted. ‘It’s not that Zambians themselves are more or less peaceful than anyone else. It’s that we have created conditions that are conducive to peace,’ said Laura Miti, a political analyst. But those conditions are beginning to look a little fragile. This, from the president of the Zambia Conference of Catholic Bishops, is a sign of just how worried Zambians are: ‘Our country is now all, except in designation, a dictatorship; and if it is not yet, then we are not far from it.’ Lusaka Archbishop Telesphore Mpundu made this unprecedented statement ahead of Sunday mass on 23 April. In a 10-page document, Mpundu tells how President Edgar Lungu’s administration has been intimidating opposition, clamping down on free speech, eroding the independence of the judiciary and using the police service for party political purposes. 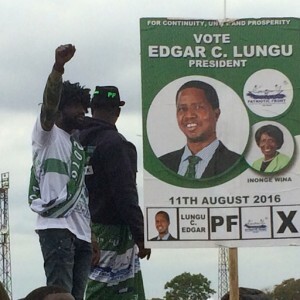 Although critics of Lungu and his Patriotic Front (PF) have been concerned for some time – ever since his 2016 election, which was marred by allegations of voter fraud – things came to a head last month with the heavy-handed arrest of opposition leader Hakainde Hichilema. Early on 11 April, about 100 policemen, many wearing balaclavas – in a sinister break from protocol, descended on Hichilema’s house. They broke down the door and used tear gas in an attempt to flush him out of the safe room to which he had retreated, along with his family. After a siege lasting several hours – in the course of which several household workers were badly beaten and Hichilema’s asthmatic wife fainted from the tear gas – Hichilema was arrested and charged with treason. His crime, allegedly, was that he endangered the president’s life by failing to move out of the way of the president’s motorcade at a cultural festival. Opposition leaders across Africa have been swift to condemn the Zambian government. The Southern African Partnership for Democratic Change (SAPDC), an alliance of opposition groups that includes Mmusi Maimane, from the Democratic Alliance in South Africa, and Morgan Tsvangirai, from the Movement for Democratic Change-Tsvangirai in Zimbabwe, called on the Southern African Development Community (SADC) to intervene. ‘As the SAPDC, we call upon SADC to intervene in this crisis instead of silently endorsing the acts of President Edgar Lungu, who is no longer committed to the democratic project. It is condemnable that Lungu has abandoned all democratic practices in order to cling to power with an iron fist, all while SADC watches. SADC, however, has remained resolutely silent on the subject of Zambia. As has South Africa, the regional superpower that wields significant political and economic influence in Lusaka. ‘South Africa could fix this mess with a strongly worded statement. But the silence from South Africa is licence for the president to continue,’ said an adviser to Hichilema, speaking off the record for fear of attribution. Nor has there been anything from Addis Ababa, home of the African Union (AU). The AU hasn’t said a word about Lungu’s alleged abuses of the democratic process, nor does there seem to be much appetite to do so. The silence from Africa’s diplomatic community is all the more concerning given the pressure faced by independent media, civil society and political opposition within Zambia. Critical voices within Zambia are being muffled, which means that external pressure is necessary to keep Lungu in check. As analyst Nic Cheeseman, from the University of Birmingham, explains: ‘[The] cumulative effect [of government initiatives against civil society] has been to signal that those who seek to resist the government are likely to find themselves the subject of the sharp end of the security forces and the PF’s manipulation of the rule of law.